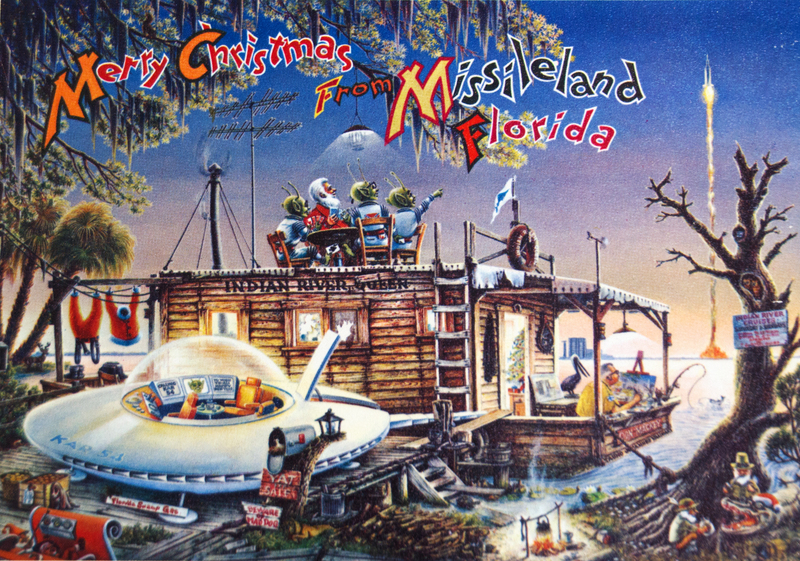 Card #1 Missileland features a houseboat called the Indian River Queen. The flying saucer is powered by Florida swamp gas. The artist himself is on the porch beside the pelican, and he is painting the missile launch. A Christmas tree is inside. Santa is on the roof in his long underwear playing cards with the aliens, and his outfit is hanging on the clothesline. On the lower right there are leprechauns and an alligator in a Santa hat! Christmas card from the 1960s and 1970s by NASA space artist Don Mackey. Card purchased on eBay.